Motor oil is used as a lubricant in cars, trucks and motorcycles. It's also important in keeping the engine cool, neutralizing acids that can damage the engine and dissolving gunky buildup. However, in some situations, motor oil can be a nuisance. If a pet crawls into the engine of a car, it can become covered in mucky oil that is difficult to remove. Mechanics can encounter motor oil in their hair when working under cars and trucks. Although it's somewhat difficult to remove, motor oil can be cleaned from the hair of humans and pets with a few everyday ingredients. Saturate the hair with vegetable oil. Rub the oil in a circular motion to loosen up the motor oil buildup. Use the towel to soak up the excess oil during the process. This may take several minutes, and the process may need to be repeated a few times. Mineral oil can also be used. Sprinkle some cornstarch in the hair. The cornstarch should absorb the remaining vegetable oil and motor oil. Depending on how much oil is in the hair, more or less cornstarch may be needed. Adjust it until you see and feel the absorption. 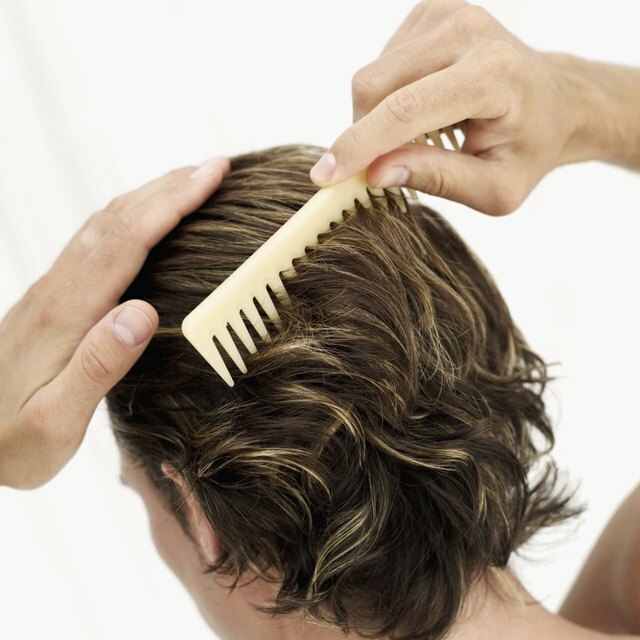 Comb through the hair using a wide tooth comb. This will remove the oil-saturated chunks of cornstarch. Wash the hair using a mild dish soap. For pets, dilute the dish soap in water, then bathe the animal. Scrub the hair for a few minutes, then rinse. Repeat the wash until all of the oil is removed. Rewash and condition the hair using a moisturizing shampoo and conditioner. Dish soap can dry out the hair, leaving it feeling brittle and weak.